Hello and welcome to J & S Plumbing and Heating. 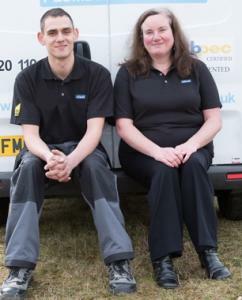 Our family run business started in 2010 providing all aspects of plumbing and heating. I am always looking for ways to further the business and my own skills to increase customer satisfaction. If you are looking for a plumber in North Hykeham, then feel free to get in contact today. I am very honored by my testimonials received from my previous customers and pride myself on providing exactly what our customers want. From the moment you call and speak to Sarah-Jane to the moment I put the final touches to your luxurious new bathroom, you will have a polite, friendly local company to make your dreams a reality.Please feel free to browse my website and if you see anything you like and need a plumber in North Hykeham, please feel free to get in contact for a free no obligation quote. Find out about your local plumber in North Hykeham. We started trading in October 2010, within this time we have taken on many big projects in and around North Hykeham, which have really kept us busy throughout the recession. We thrive on new challenges and enjoy being out and about, helping people with every project. So if you are looking for a plumber in North Hykeham then feel free to get in contact for a free, No obligation quote. Gas engineers will often have a range of qualifications that allow them to carry out specific types of gas work. It’s important to check what work they are qualified to do before you use them. Every gas engineer carries a Gas Safe Register ID card with their own unique licence number, showing the type of gas work they are qualified to do. Before any gas work is carried out, always make sure you ask to see the Gas Safe Register ID card. JAS Plumbing and Heating are fully insured for all plumbing and heating work. J and S Plumbing and Heating are vetted and approved by Checkatrade. I have used union plumbing on several occasions and always found them to be prompt, courteous and work completed to a good standard. I do not hesitate to recommend them and will be using them myself in the future.